Hoya is an Asclepiad genus of 200–300 species of tropical plants in the family Apocynaceae (Dogbane). Most are native to Asia including India, China, Thailand, Malaysia, and Indonesia, There is a great diversity of species in the Philippines, and species in Polynesia, New Guinea, and Australia. 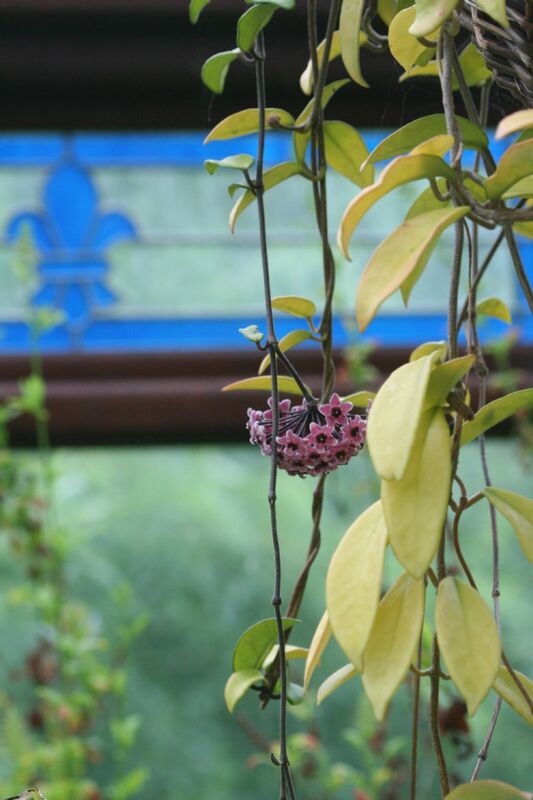 Common names for this genus are waxplant, waxvine, waxflower or simply hoya. This genus was named by botanist Robert Brown, in honour of his friend, botanist Thomas Hoy. Most Hoyas are evergreen creepers. They often grow epiphytically on trees; some grow terrestrially, or occasionally in rocky areas. They climb by twining, and with the employment of adventicious roots. 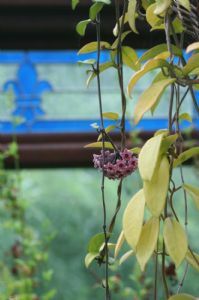 Mine (from which plants for sale are propagated by cuttings) has grown and flowered dangling happily from the same small hanging basket in a north-facing conservatory for over 10 years. At least some species exhibit Crassulacean Acid Metabolism (CAM), including H. carnosa. Several species exhibit adaptations for mutualism with ants by providing modified leaves for domatia ("homes"), much as in the related genus Dischidia; H. imbricata has leaves that form a concave cup over the tree trunk it climbs up to shelter ants, and H. darwinii has arrangements of bullate leaves on its stems to form shelters. Flower form is typically star-shaped, with five thick, waxy, triangular petals, topped with another star-shaped structure, the corona. Colours on most species range from white to pink, they can be sweetly scented. and most produce abundant nectar. Pollinators include moths, flies, and ants. Pollination is poorly understood, but plants left outdoors in temperate regions do sometimes produce seed, indicating pollination by local insects.